Posted April 8th, 2011 at 3:08 pm | Log in to reply. I am so happy right now having two large containers of shikhye in my fridge. It is delicious and a hit with everyone. Maybe after the kids are asleep tonight I will take a nice hot shower, make a funny towel hat for myself and then drink a big glass of shikhye so I can pretend I am at a jjimjilbang. Posted October 17th, 2010 at 2:17 pm | Log in to reply. I can just pour 6 cups of water in my rice cooker. is it enough for sikhye when I use it or should I use a bigger basin? Posted September 19th, 2010 at 8:15 pm | Log in to reply. This morning I checked my sikhye, it seems done and smell good also, now I already boil it and waiting for the sikhye to turn cool and put in refrigerator, after fermented some of the rice will float on the surface of sikhye,the taste of the rice also good. I am using brown sugar so the colour of the sikhye a little bit brownish than what you display on website video. Thanks Maangchi. Posted March 22nd, 2011 at 1:12 pm | Log in to reply. Posted September 19th, 2010 at 11:51 am | Log in to reply. on the electrical stove, I hope it will success. Thanks so much for the recipe, cann’t wait to try the drink. Posted September 18th, 2010 at 1:26 pm | Log in to reply. I am new to your site and love it!!! I tried sikhye in a korean restaurant..<3 it!! It had a ginger flavor which was good. 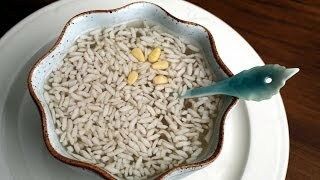 I'm in the process of fermenting my rice with the barley water. I'm sure I'll be making this again. To save time, can I make and store my clear malted water in the refrigerator the day before? Posted July 25th, 2010 at 11:46 pm | Log in to reply. how long did it take you to make that though? Posted July 21st, 2010 at 5:17 pm | Log in to reply. Can this recipe be made with Brown Short Grain rice?? Posted July 23rd, 2010 at 4:14 pm | Log in to reply. I would use white rice. Posted November 4th, 2012 at 1:43 am | Log in to reply. Posted July 15th, 2010 at 5:06 pm | Log in to reply. I really love this drink. I got it just ready at a Korean Store. Unfortunately I can`t find the malt powder so I wanted to ask whether I can just use Boricha (Barley tea) and grind it or would that be a bad idea? Posted July 15th, 2010 at 11:37 pm | Log in to reply. Posted June 28th, 2010 at 8:51 pm | Log in to reply. I had this drink after a Korean dinner at a restaurant, they called it “rice punch” I believe it was the same. I noticed the flavor of ginger in the drink and really enjoyed the ginger flavor added to the drink. At what point can I add the ginger? Perhaps when the mixture is on the stove top to cook the ginger? Thank you for your assistance…. Posted June 29th, 2010 at 1:23 pm | Log in to reply. If you want to add ginger, add it right before step 10. Step 10: Add 1 cup of sugar and bring to a boil. Posted June 8th, 2010 at 12:58 am | Log in to reply. I bought the Malted Bailey Powder in US and I made the rice drink successfully. Thank you very much for your recipe. Posted May 14th, 2010 at 6:21 pm | Log in to reply. I dont think my rice cooker is big enough. Can I reuse the rice or is there a different way to do this? Posted May 15th, 2010 at 11:35 am | Log in to reply. yes,it’s possible to make shikhye without using a rice cooker, especially when you make large quantities. Keep it on the stove with low heat and when it reaches hot temperature (more than 40 Celsius), turn the heat off. Then reheat it again when it cools down (about 30 Celsius). You will have to keep an eye on it. Don’t let it boil over. If it’s too hot, the rice grains in shikhye will not be fermented. Good luck with your shikhye making!! Posted April 23rd, 2010 at 8:37 pm | Log in to reply. Posted April 23rd, 2010 at 8:52 pm | Log in to reply. yeah, the package says it’s fine malt powder but it looks coarse in the second photo. Don’t worry much about it. It’s just wrong translation. Put the mixture of water and coarse barley malt flakes into a strainer and wait for water to drain out. Throw away the stuff in the strainer. Then wait until the fine sediments are sunk on the bottom. You need only clear water to make shikhye. Posted March 24th, 2010 at 9:24 pm | Log in to reply. this is probably a stupid question, but is it possible to make shikye without a rice cooker? Posted March 25th, 2010 at 1:04 pm | Log in to reply. Of course it’s possible to make shikhye without using a rice cooker, especially when you make large quantities. Keep in mind only one thing keep the temperature warm about 40 Celsius. If it’s too hot, the rice grains in shikhye will not be fermented. Posted March 25th, 2010 at 9:56 pm | Log in to reply. so should i just keep it on the stove with the heat barely on and keep checking the temp.? oh, and btw, thanks so much for your reply hon, i love your recipes, especially your kimchi, its simply the best, ive tried so many other recipes and none of them are as good or as easy to make, it comes out perfect everytime!! Posted March 26th, 2010 at 8:18 am | Log in to reply. You will have to keep an eye on it. Don’t let it boil over. Posted March 12th, 2010 at 4:04 am | Log in to reply. Wow, wonderful delicious sihkye, mine came out delicious! I have been enjoying it nightly for dessert, I love the malted barley flavor, and the sweetness with the ice cubes floating in it. I’m making another batch right now for my nieces, they are going to LOVE it as a drink to go with their salty snacks while they study. So much better than the canned stuff, thanks Maangchi for making this video and recipe available for me to make it! Posted March 13th, 2010 at 1:52 am | Log in to reply. Congratulation! “the sweetness with the ice cubes floating in it”, ooh, it sounds very delicious and cool! Posted March 9th, 2010 at 11:22 pm | Log in to reply. Posted March 10th, 2010 at 11:17 am | Log in to reply. I hope someone else give you the answer. Posted April 1st, 2010 at 12:38 pm | Log in to reply. that is probably sweet rice water it tends to be a little expensive because the process is very time consuming. but i dont mind spending a little more ^ ^”. its also very delicous yum yum! The video was watched 349,326 times on YouTube & has 2,359 likes!